A bowl of oatmeal strawberries, apples and bananas may be a wholesome breakfast food for you, but not for your cat. 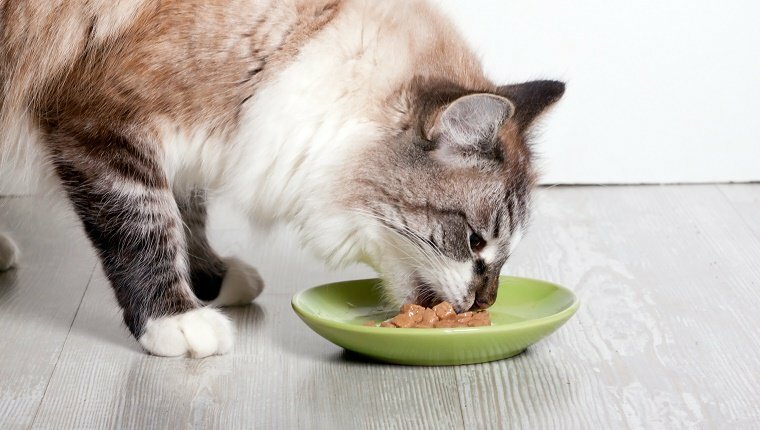 Oatmeal is safe for your kitty just in the form of treats given on a rare basis. It is loaded with nutrients, being rich in carbohydrates, vitamins (B and E), antioxidants, fiber, as well as minerals like selenium, zinc, calcium, and iron. However, considering the small proportion of it, your feline friend should eat, a wholesome oatmeal diet would not benefit it much. A spoonful of oatmeal given once in a while would not hurt your cat. However, having it in excessive amounts or on a routine basis may result in a host of digestive problems like vomiting or diarrhea. If your cat reacts differently or shows allergic symptoms after having even a morsel of oatmeal, do not delay in contacting a veterinarian. Since most felines are lactose intolerant, prepare oatmeal with water rather than milk. You can also sprinkle a spoonful of it to their dry/wet food. Avoid adding too much of salt or sugar as both may affect the cat’s health adversely. Refrain from giving you cat oatmeal cookies as it is high in calories, also containing raisins and chocolates, both of which is toxic to your kitty. Published on January 3rd 2018 by Maxi Gold under . Article was last reviewed on 3rd January 2018.